Bokmål ([ˈbuːkmoːl], literally "book tongue") is an official written standard for the Norwegian language, alongside Nynorsk. Bokmål is the preferred written standard of Norwegian for 85% to 90% of the population in Norway, and is most used by people who speak Standard Østnorsk. Bokmål [...] is in its most common variety looked upon as reflecting formal middle-class urban speech, especially that found in the eastern part of Southern Norway, with the capital Oslo as the obvious centre. One can therefore say that Bokmål has a spoken realisation that one might call an unofficial standard spoken Norwegian. It is in fact often referred to as Standard Østnorsk ('Standard East Norwegian'). 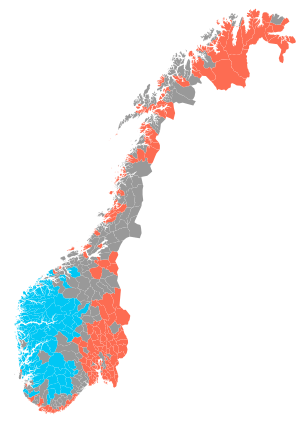 Standard Østnorsk (Standard East Norwegian) is the pronunciation most commonly given in dictionaries and taught to foreigners in Norwegian language classes. 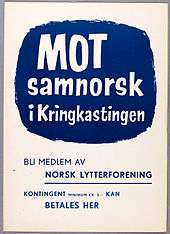 Poster from a campaign against mandatory Samnorsk, circa 1955. The 1938 reform in Bokmål introduced more elements from dialects and Nynorsk, and more importantly, many traditional Dano-Norwegian forms were excluded. This so-called radical Bokmål or Samnorsk (Common Norwegian) met even stiffer resistance from the Riksmål movement, culminating in the 1950s under the leadership of Arnulf Øverland. Riksmålsforbundet organised a parents' campaign against Samnorsk in 1951, and the Norwegian Academy for Language and Literature was founded in 1953. Because of this resistance, the 1959 reform was relatively modest, and the radical reforms were partially reverted in 1981 and 2005. ↑ Hammarström, Harald; Forkel, Robert; Haspelmath, Martin; Bank, Sebastian, eds. (2016). "Norwegian Bokmål". Glottolog 2.7. Jena: Max Planck Institute for the Science of Human History. ↑ Vikør, Lars. "Fakta om norsk språk". Retrieved 2014-02-09. 1 2 Lundeby, Einar. "Stortinget og språksaken". Retrieved 2007-06-12. ↑ Halvorsen, Eyvind Fjeld. "Marius Nygaard". In Helle, Knut. Norsk biografisk leksikon (in Norwegian). Oslo: Kunnskapsforlaget. Retrieved 6 February 2010. ↑ "Råd om uttale". Retrieved 2009-03-15. 1 2 3 Kristoffersen, Gjert (2000). The Phonology of Norwegian. Oxford University Press. ISBN 978-0-19-823765-5. 1 2 3 4 Haugen, Einar (1977). Norwegian English Dictionary. Oslo: Unifersitetsforlaget. ISBN 0-299-03874-2. 1 2 Gjerset, Knut (1915). History of the Norwegian People, Volumes I & II. The MacMillan Company. ISBN none. ↑ Hoel, Oddmund Løkensgard (1996). Nasjonalisme i norsk målstrid 1848–1865. Oslo: Noregs Forskingsråd. ISBN 82-12-00695-6. ↑ Larson, Karen (1948). A History of Norway. Princeton University Press. ↑ Skjekkeland, Martin (1997). Dei norske dialektane. Høyskoleforlaget. ISBN 82-7634-103-9.